Chief Tecumseh (1768-1813) – Tecumseh’s given name was actually Tecumtha or Tekamthi, meaning Celestial Panther Lying in Wait. Born in 1768 at the Shawnee village of Piqua on the Mad River, southwest of the present day city of Springfield, Ohio, Tecumseh he grew up to be highly skilled warrior, orator, and statesman who advocated “civilized’ resistance.” His father, who was also a chief, was killed at the Battle of Point Pleasant in 1774. Tecumseh and his followers believed that their lands belonged to all the tribes in common and denied the right of the Government to make land purchases from any single tribe. The government refused to recognize this principle, and in 1795, Tecumseh refused to sign the Treaty of Greenville, which ceded much of present-day Ohio to American settlers. He then began to form a confederacy of tribes for the purpose of holding the Ohio river as the permanent boundary between the the white settlers and the Indians. In 1808, he and his brother, Tenskwatawa, who was known as the “Prophet,” established a “headquarters” for the confederacy on the banks of the Tippecanoe River, the site of present-day Prophet’s Town, Indiana. On November 7, 1811, while Tecumseh was away, the alliance suffered a setback when Indiana Territory Governor William Henry Harrison attacked and defeated the “Prophet” and his men at Tippecanoe. 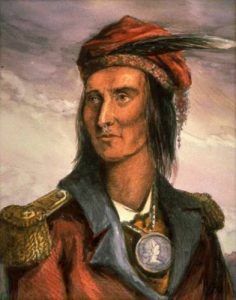 But, Tecumseh persisted, and when the War of 1812 erupted, he led his forces to the support of the British, and was rewarded with a regular commission as brigadier general, having under his command some 2,000 warriors of the allied tribes. He was killed in the Battle of the Thames on October 5, 1813.